Shares fell heavily on Wall Street on Monday after a leading ratings agency fanned fears of Europe’s debt crisis spreading across the Atlantic by issuing a strong warning about America’s failure to tackle its budget deficit. S&P said that compared with the small number of developed countries with a coveted AAA rating, the US had “very large budget deficits” which reached as high as 11% in 2009. With the political infighting between the Republicans and Democrats on the deficit now so bitter that there was a risk of the US government being shut down earlier this monthStock markets fell across Asia on Tuesday morning as investors took fright at ratings agency Standard & Poor’s downgrade of the outlook on US debt. The Nikkei was down 1.25% at the close, 119 points lower at 9,437, while the MSCI index of Asia Pacific stocks fell 0.53%, or 2.6 points, to finish at 493.6. Gold was also at a record high – with traders asking for $1,499 an ounce for the precious metal at one stage, just $1 away from breaking through $1,500. The threat of a downgrade raises the stakes in the struggle between President Obama’s Democratic administration and his Republican opponents in the House to get control over a nearly $1.4 trillion budget deficit and $14.27 trillion debt burden. The White House last week announced plans to trim $4 trillion from the deficit over the next 12 years, mostly through spending cuts and tax hikes on the rich. Congressional Republicans want deeper spending cuts and no tax increases.The deficit problem has become crushing since the financial crisis of 2008. Now for every dollar the federal government spends, it takes in less than 60 cents in revenue. Lets look further at the Dow Jones Industrial Average. As predicted, the recent test at Upper Bollinger band is futile with divergences seen in RSI & MACD. 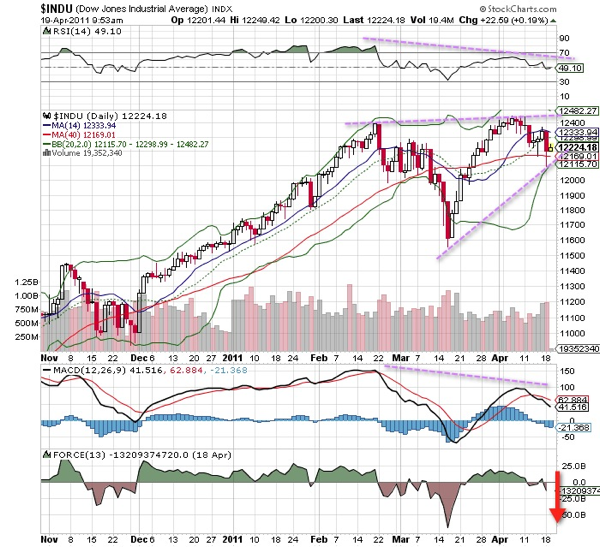 After the S&P’s downgrade, the Dow Jones Industrial Average tested the lower Bollinger band. For now, the consolidation should stays within 12100 – 12500 with higher downward bias.